VAAT30 Motor: 40-140 rpm. 3 Oit. F3-F6. Lâminas: Alumínio 57-38 mm. Afinação A: 442 Hz. Frame: Traveller. Comprimento: 150 cm. Topo Grave: 74 cm. Topo Agudo: 50 cm. Altura Ajustável: 83-103 cm. Artist Alpha Vibraphones: At first sight, the visual energy of Alpha Series captures your attention - the design's flowing lines and uninterupted curves draw you towards the instrument. After playing the keyboard for a few moments, the advances made possible by the new Alpha tuning method are apparent - the vibraphone's sound is voluminous throughout the range, and is easily controlled by Adams advanced pedal dampening system. Motor/Power Adaptor: The newly designed Adams Vibraphone Motor features quiet belt drive operation, easy to use controls, adjustment between 40-140 RPM with digital display panel, and a worldwide power supply adapter kit for use between 110-220V. The Alpha Series control panel is elegantly integrated into the small end piece. The Artist, Concert, and Solist Motor Control Panels are conveniently located on the right side of the instrument for quick access. 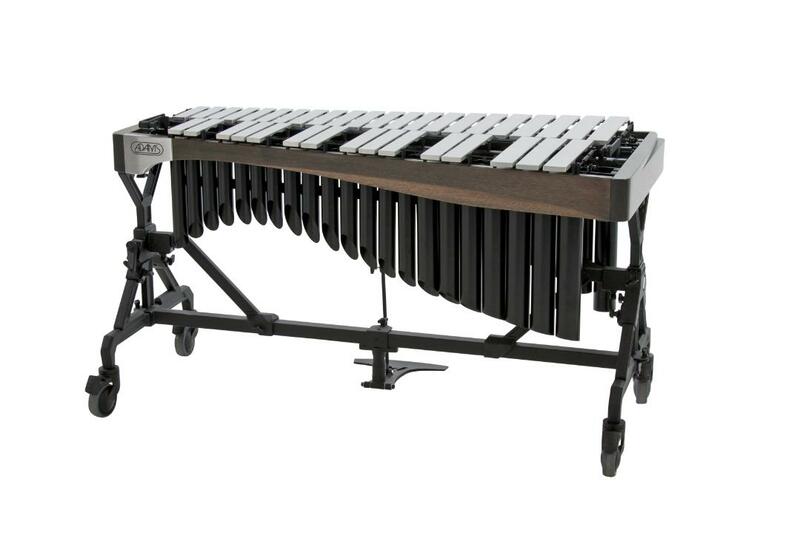 The Adams Vibraphones are available in three versions, all featuring 3 octave range, and 3.1 octave range with precision graduated Adams aluminum alloy, nickel anodized bars. Adams Vibraphone produces a beautiful tone of unmatched quality, perfectly balanced throughout the instruments entire range. Its motor and drive belts are completely enclosed within the end cap of the instrument, providing both easy access to its top mounted controls, and excellent protection from the elements. A new, patented, Adams fan system drives the fans directly from the side, and the instrument’s 12 volt motor runs from a completely safe 110 or 220 volt power adapter, totally eliminating the possibility of any electrical hazard and offering the player freedom from incompatible (European/Asian) power sources as well as limited access or no access to stage outlets. The motor speed is fully adjustable from 25 to 150 rpm. The speed is digital readable and offers easily accessible switches allowing the player to choose whether the fans stop in either the open or closed position. A newly advanced, foot operated precision dampening mechanism, offering full pedal tension, damper, and height adjustments, allowing each player to custom configure the feel of the instrument to their exact playing style. The damper also utilizes a new supreme quality felt material to achieve true silent damping. All resonator tubes are fully welded to eliminate all unwanted noises, and are beautifully finished in a durable grey powder coat finish. All models offer all the features above differing only in a choice of different frame systems. The Artist Classic Vibraphone is now available with in both Gold and Silver finishes, on both Traveler and Voyager Frames, and with or without motor. Adams Artist model features Adams new traveler system, a strong and steady frame with 100 mm swiveled wheels. End pieces and rails are made from the finest French oak wood, clear lacquered. Graduated bars from 58 mm till 38 mm, range F3-F6.